It goes without saying, even the least savvy market watcher can easily assert the correlation that oil and the markets as a whole have been trading in tandem. So when oil shot out of a cannon starting Thursday when it bottomed around 26.6 and moved all the way to 32/barrel it came as no surprise that it took the markets with it. Whether it's up or down, it is human nature for market speculators to continue to try to find a bottom or a top in the current environment that were in. Speculation, in its most natural state, is done in such a way to avoid being the sucker. No one wants to be left holding the bag on the way up, and no one wants to miss the bounce on the way down. This peculiar, yet rather unfortunate state, is why we often see irrational buying when markets implode, and incessant top calling when markets sky. No man wants to be the "fool" in any/either circumstance. Since the bounce in oil was all but telegraphed it puts the markets in an interesting position. It has been commonplace for oil and gas speculators to buy oil/gas when the weather gets cold and to cut it when weather gets warm again. So with the first blizzard of the year, and biggest one in years, combined with oversold conditions, risk in oil to the upside, and an overall market technical bounce, the bounce in oil futures was pretty much a "slam dunk." Personally, I am of the mindset and the belief it is always best to avoid getting in the way of a train in motion (in this case oil moving lower). If you as a speculator believe that you can stomach whatever downside risk exists in oil, by all means have fun. From experience, I have learned that markets are significantly irrational and that they more than often overshoot beyond anyone's "rational" expectations. With all that said, my bias on the overall markets currently is still bearish. That doesn't mean I am advocating blindly shorting, or suggesting that we are imminently going lower. I am simply looking at multiyear charts on multiple time frames in the SPY/SPX and CL_F and they still all look dismal. 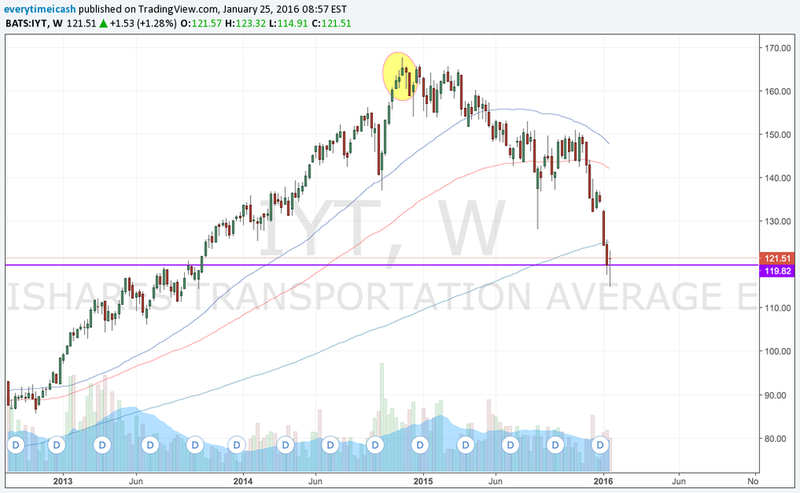 This move lower in the markets in general was telegraphed by the transports in November of 2014 when the IYT topped out and began its imminent decline. (Not) Coincidentally, the WTI broke multiyear support that same month and has never looked back. If we expand the charts to the start of the bull run in 2009 we notice that both these issues had stellar performances starting in 2009. The IYT advancing almost 400% (rough estimate) and WTI advancing nearly 335% (rough estimate again). The parallels here are fascinating with the most interesting caveat being that even with their sharp declines there is still room to run. Only recently did oil break its 2009 base bottom and the downtrend in the oil markets only calls for further downtrend in the IYT as shipping costs via trucking decrease in price with the falling price of gas. The main point I am making here is that trends don't happen overnight. Just like the IYT and WTI broke almost 1.5 years ago and we're only now reeling from their problems, a two day rally that was telegraphed doesn't reverse course. It is important to take things as they are, and to remain steadfast with the overall (larger) picture. My bias will remain negative on both oil and the markets so long as the larger picture for both these issues remains to the downside.